In Russian political circles, Barack Obama's election tended to evoke two different reactions. Many officials were curious to see what new deals he would offer, but others, in the tradition of the Cold War, dismissed him as just the latest mouthpiece of the old American élites. If any of them experienced Obamamania, they sure kept it to themselves. So it's little wonder that Obama's drive to put aside old grudges and start fresh with Moscow has come up against stubborn resistance from the Kremlin in recent months. Secretary of State Hillary Clinton will likely face a tough test when she arrives in Moscow for a two-day visit on March 18, because, as a senior official from the Obama Administration puts it, "We've definitely overloaded the circuits in this relationship." For Clinton, the word overloaded is itself a reminder of where things began to go wrong. Last March, she had the honor of starting Obama's charm offensive by presenting her Russian counterpart, Sergei Lavrov, with a little red button. It was supposed to have the Russian word for reset on it and was meant as a harmless bit of fun. But thanks to a spelling mistake somewhere in the State Department (presumably the Gimmicks Directorate), Lavrov had to explain that the button actually said overload. It caused some awkward laughter. "We won't let you do that to us," Clinton joked, and they went ahead and pressed the button anyway. "So that's how things have turned out," says Dmitri Rogozin, Russia's envoy to NATO. "They pressed the wrong button, and over time the relationship was overloaded. So far the right button still hasn't been pressed." It didn't look that way in the beginning. There was hope in the first few months of Obama's presidency that the bad blood from the Cold War and the George W. Bush years could be washed away with little more than a push of a button. For example, on Obama's first visit to Moscow, last July, President Dmitri Medvedev agreed to allow U.S. weapons and personnel to pass through Russian airspace en route to Afghanistan. It was a huge relief to American troops, who had been trucking most of their supplies through the death trap of Pakistan's Khyber Pass. Since it was granted without any favors in return, the deal looked like more than the usual horse trading. It was a gesture of goodwill. Less than three months later, there was another breakthrough. On Sept. 17, Obama scrapped the Bush Administration's plan to build a missile shield in Eastern Europe, which had been seen by Russia as a blatant military threat. Even Prime Minister Vladimir Putin was impressed. He had been icy toward Obama during their July meeting  there were certainly no hugs and smiles like the ones he gave Iran's President in Tehran in 2007. But in September, Putin called Obama's decision to ax the missile shield "correct and brave," and Russia's threat to "neutralize" Bush's plan by aiming rockets at Europe was quietly put aside. The Russian public also started coming around. According to surveys by the Levada Center, an independent pollster, only 28% of Russians said they had a negative view of the U.S. in the wake of the decision, down from 55% when Obama was elected. But inside the Russian government, the trend was going in the opposite direction. 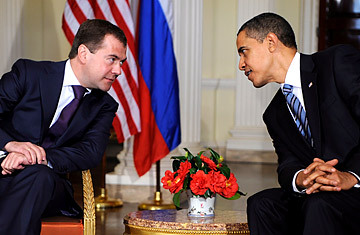 Medvedev and other liberals still felt trust for Obama and seemed ready to meet him halfway. But conservatives  mainly old-school apparatchiks, security chiefs and former KGB officers like Putin  began to express their doubts about the reset in relations. "It's been frustrating," the U.S. senior official tells TIME on condition of anonymity. "We came in with an aggressive reset mentality, and it was not necessarily shared by everyone in the Russian government. The Russians are overwhelmed by all the things we want to do tomorrow, and they say, Let's take time." Rogozin puts the matter more bluntly. "Medvedev sincerely believes that Obama can be trusted," he tells TIME. "But that doesn't mean this opinion is shared at every level, especially the levels where the implementation of their agreements is borne out." This reality  the disconnect between what Medvedev pledges and what Russia does  has eroded the spirit behind the reset strategy as well as its practical objectives. Take, for example, the delays in completing the START treaty, which aims to cut the world's two biggest nuclear arsenals by a third. Last July, Obama and Medvedev signed a preliminary deal and appointed negotiators to work out the details. Obama said the deal would be finalized by the end of 2009. But that deadline has come and gone, and no new time frame has been set. Even the agreement on the military transports has gotten tangled up in its implementation. On paper, the deal allows 4,500 U.S. military flights over Russia per year, but so far this year, there have been fewer than 100. Perhaps more disturbing is the return of Cold War rhetoric ahead of Clinton's visit. The most alarming exchanges have centered on a new missile shield being proposed by Obama to protect against threats from Iran and North Korea. The new shield would be built farther away from the Russian heartland, but it has still roused the same fury from Moscow, which last month renewed its threat to point tactical missiles at Europe. And in December, Putin suggested the possibility of a new arms race between the Cold War foes. Sergei Markov, a conservative parliamentarian from Putin's United Russia Party, says these escalations point to the conservative camp's main problem with the U.S.: a lack of trust. "There are people at the top who see Obama as just a temporary man who will soon be replaced by another," Markov tells TIME. "There are people at the top who say this reset is all just a trick, that if we go along with it, they will begin pushing for maximum limitations on Russia's influence." Conservatives also want something in return, he says. "What Russia wants is to be recognized as a great power in the region, a power that defends all its regional interests. But Washington is so far denying Russia this status." How Clinton will deal with the growing tensions remains to be seen. But Obama's dream of wiping the slate clean and seeking real pragmatic ties with Russia has begun to look naive. And it's becoming increasingly clear which Kremlin faction is calling the shots.